Cal Poly will host the 31st Annual CSU Research Competition April 28-29. The competition is held to promote excellence in undergraduate and graduate scholarly research and creative activity by recognizing outstanding student accomplishments throughout the 23 campuses of the California State University. Three students from the College of Liberal Arts will represent Cal Poly at the competition. Ten students from each CSU campus are selected to compete in the competition. Of the 10 students selected from Cal Poly, three are from the College of Liberal Arts: Katelyn Tomasello (Music and Psychology ’16); Sayaka Tsugai, a fourth-year political science major; and Emily Matthews, also a fourth-year political science major. The CLA delegates' research projects are each related to their areas of study. As a political science major, Matthews’s research project aims to define the problems of United States leadership in global politics. “I focus on domestic partisanship and challenge conventional wisdom that ideology drives partisan divides in the area of climate change,” Matthews said. Tomasello’s project was a fulfillment of her Cal Poly senior project. She says her research tries to answer the question: How has music been used among juvenile offenders, and what characteristics does that music have? To this end, she analyzed the musical characteristics (e.g., tempo) of pieces successfully used in published reports/music therapy. Finalists will make oral presentations before juries of professional experts from major corporations, foundations, public agencies, and colleges and universities in California. They will be judged on their oral presentations and written abstracts. Cash prizes will be awarded to students for the most outstanding presentations. The Cal Poly Mock Trial Team earned a bid to compete at the American Mock Trial Association National Championship Tournament in Los Angeles on April 21-23. This is the first-time Cal Poly has earned a spot in the prestigious national tournament. Cal Poly’s A Team finished in the top six teams in their Opening Round Championship Series in Fresno on March 25-26. Team members are political science students Deeksha Kohli, Zackery Michaelson and Jesse Quiroz; business student Chloe Loomer; mathematics student Rod Rahimi; and civil engineering student Garrett Rutherford. “I could not be prouder of our team and their awesome work,” said Elizabeth Lowham, chair of the Cal Poly Political Science Department. Every year, AMTA publishes a fictitious legal case, and teams from across the country argue the case in front of real judges. Universities field teams that compete during rounds that last about three hours, during which one college represents the prosecution and the other represents the defense. "We put in hours of practice every day, four days of the week for almost three months in preparation for those trials and I personally am overjoyed that we were so successful," said Michaelson. During the 2016-2017 season, more than 600 teams competed nationwide in AMTA competitions. Cal Poly's A Team is now one of only 48 teams in the nation that will compete at NCT — the final round of the AMTA's annual national tournament structure. The Cal Poly Mock Trial program started in 2006. Lowham says Mock Trial is an activity that the Political Science Department aims to grow and touch all students across all disciplines on Cal Poly's campus. "Mock Trial has become this amazing space for co-curricular excellence and opportunity that helps build relationships across colleagues," Lowham said. "I'd love to think that we can continue to play a role in that space." Under the direction of Justin Cooley, a lecturer in the Political Science Department, 32 students from across the university participated in Mock Trial during the 2016-17 season. The teams competed in five invitational tournaments and two scrimmages, including their first invitational outside of the state of California. Three teams competed in two regional tournaments; one at the Pomona/Claremont McKenna Colleges and one at Arizona State. At the Pomona/Claremont McKenna Regional Competition, Michaelson won a best regional attorney award. "I think Mock Trial represents one of the best examples of Learn By Doing that the Political Science department has to offer," said Michaelson. "When we are successful in this activity we are displaying the knowledge and skills provided to us by this amazing department." Twenty Cal Poly students, including three from the College of Liberal Arts, were recognized for their awards and other accomplishments by state lawmakers on the floors of the state Assembly and Senate in Sacramento on Monday, Feb. 13. Naba Ahmed, a journalism major in the College of Liberal Arts, was part of the award-winning Mustang News team that competed at the 2016 Associated Collegiate Press/Media Association’s National Convention. The group received 16 national awards. In addition, Mustang News earned first-place honors for Best Social Media Strategy, Online Infographic, Multimedia Feature Story and Breaking News Photo. The team also collected the ACP Online Pacemaker, which is considered the highest honor in college media, for the best design, ease of navigation, writing and editing, graphics and interactivity of a website. 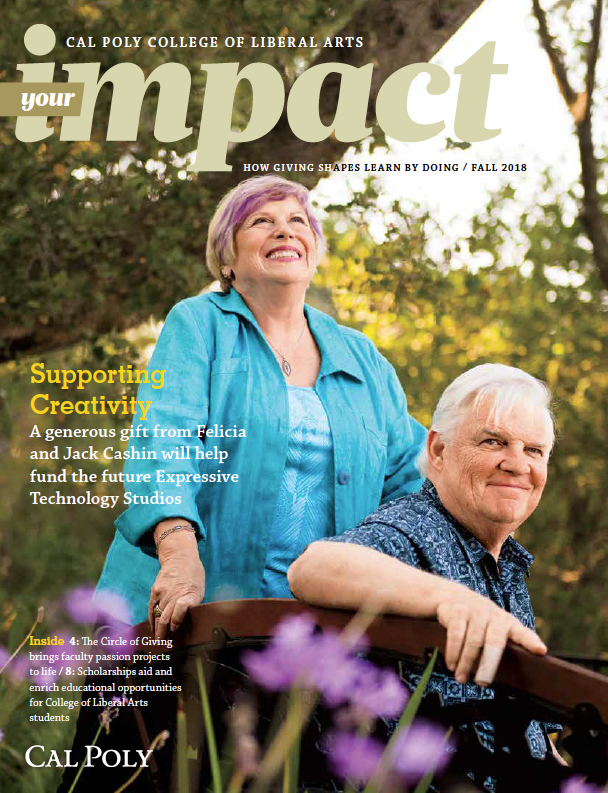 Journalism Department Chair Mary Glick credited the Learn by Doing philosophy for the group’s success: “I think the kind of faculty involvement and student interest really drives excellence in what we produce.” Ahmed’s interest in journalism was fanned in high school as a member of the Mira Costa High School’s award-winning “Hoofprints” yearbook staff. As a member of Mustang News, she worked as the news editor and reporter. Journalism major Cameron Bones in the College of Liberal Arts received top honors and $2,000 at the Graphic Arts Education and Research Foundation’s 2016 Student Design Competition. More than 400 students from high schools and colleges across the nation submitted entries in the eighth annual contest. They were to challenged to design and create an engaging infographic — a graphic design that presents complex information quickly and clearly — on a topic of their choice. Bones choose coffee consumption in the U.S. and printed her infographic on a coffee mug. She and her instructor, Daria Matza, received a two-day, all-inclusive trip to Orlando, Fla., for GAERF’s EXPO ’16. Graphic communication major Lindsay Mitchell studies in the College of Liberal Arts and is working on minors in packaging and integrated marketing communications from the Orfalea College of Business. She was part of the eight-member student team that received the Excellence Overall Award in the Phoenix Challenge Flexo Packaging Competition at the Flexographic Technical Association’s 2016 Forum. The yearlong project challenged students to help a local company rebrand and market its business with materials using the flexographic print process — a technique that uses a flexible plate to print on a variety of materials. The Cal Poly team competed with nine other schools in Fort Worth, Texas. Mitchell and her teammates worked alongside B.R.A.T., a pediatrician-recommended diet drink that combines bananas, rice, applesauce and toast into a medicinal beverage for children and adults who are prescribed this type of diet when ill. As part of the competition, the team redesigned packaging graphics and structures, and created a child-size container with a glow-in-the-dark game on the label for kids, a shrink sleeve bottle for adults and a point-of-purchase in-store display. On campus, Mitchell sits on the executive board of University Ambassadors, known as Poly Reps, is one of three students on the Graphic Communication Advisory Board, and was involved in the Technical Association of the Graphic Arts, New Student and Transition Programs and National Society of Collegiate Scholars. and Jasper Lim. Photo courtesy of TAGA. A team of students from Cal Poly’s Graphic Design Department won the Grand Prize Award at the Technical Association of Graphic Arts (TAGA) Annual Technical Conference held March 19 – 22 in Houston. 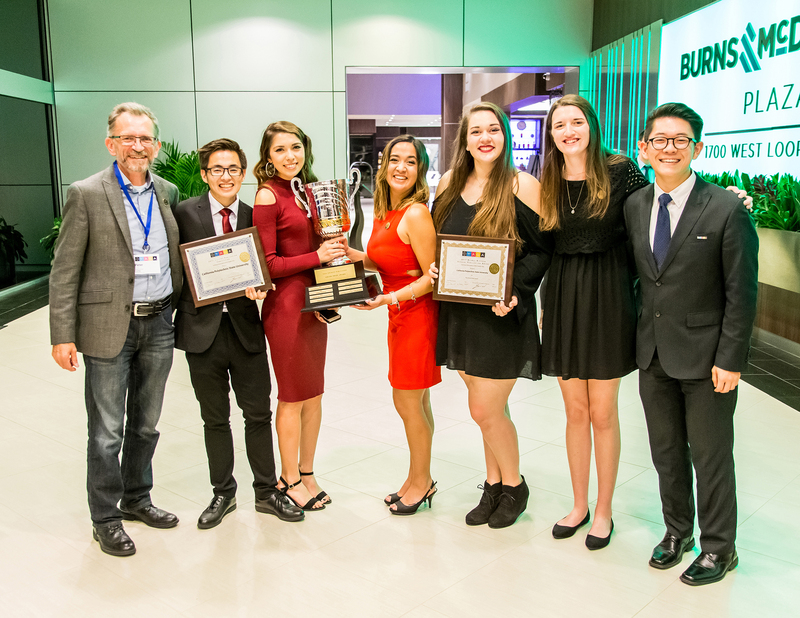 The winning team was led by Mayra Mejia, president; Jacqui Luis, vice president and treasurer; Amanda Ornelas, production; Jasper Lin, design; Alan Nguyen, digital; Molly McCarthy, marketing; and Peter Schlosser, advisor. This is the first time Cal Poly has won the grand prize, the Helmut Kipphan Cup, in 10 years. In order to compete, each student chapter submits a high-quality journal to showcase their technical papers. Papers are invited on emerging science, technology, and applications of all forms of graphic technology and printing processes, including offset, flexo, gravure, digital, inkjet, pad, and screen. The scope of the conference encompasses topics such as color management, materials, packaging, curing, process control, data management, workflow, security, nanotechnology, MEMS, electronics, and fundamental science. Since the establishment of the TAGA Student Chapters in 1985, student chapters have produced technical publications to showcase their student research, and starting in 1993, the TAGA board of directors has given a Grand Prize Award to recognize their efforts in producing their TAGA Student Publications. Renamed in 2006 as the Helmut Kipphan Cup (after Dr. Helmut Kipphan—for his time, support, and advocacy of the TAGA Student Chapters), the award is now a traveling trophy that is presented to the school that has produced a student publication that excels in technical content, print quality, and design. Alexa Arndt (Political Science ‘15) is currently a second-year law student at Villanova University School of Law. She is putting her political science education to work on behalf of the homeless and those living in poverty with the hopes of becoming a public defender. Arndt has already worked with a number of reputable organizations including the New York Legal Assistance Group, Homeless Advocacy Project and the Philadelphia Defender Association. What inspires you to work with organizations like the Homeless Advocacy Project? Homelessness is a very visible issue both here (Pennsylvania) and in San Luis Obispo. I first become interested in homelessness during my first year of undergrad. After taking the Politics of Poverty with Professor Williams during my third year, I really began to study it and look for ideas within the legal profession. One of our class assignments involved spending the night in a shelter to help supervise, make coffee, etc. It was one of the only educational experiences I had up to that point that truly made me uncomfortable. I had never really had to deal with nor look at homelessness, but this experience made me want to focus on the legal problems they faced. Society tends to look away, leaving others to feel like everyone else has given up. Professor Williams supervised my senior project, which examined the perceptions homeless people had of the criminal justice system. I asked about their experiences with judges, public defenders, and police. I conducted my interviews at the Prado Day Center. I remember thinking it was strange how it was hidden behind other buildings by the freeway, completely invisible from the rest of the city. I hoped to use that information to guide my law school experience and learn how I could best attend to their needs. What was your biggest takeaway from working with the New York Legal Assistance Group? Honestly, the single biggest takeaway was that there are massive injustices in areas I had honestly never considered. I was placed in elder law by random chance, and I absolutely loved the attorneys supervising me. I was only there for five days, but I was able to get a feel for the issues they were facing. The primary focus of the elder law unit was protecting indigent clients from abusive state-funded care providers. We were inundated with claims of companies reducing the amount of care their patients were receiving. The services rendered involved helping them bathe, dress, and turning them over in bed, among other fundamental tasks. Essentially, these companies would reduce what they were willing to do, to the point that our clients were in danger of bed sores, falls, and other major injuries. I had the opportunity to go to a hearing, where I found that they had hired an attorney to literally sit in the administrative office all day to withdraw the reductions. These companies were reducing the services they were willing to render and hoping no one would challenge the reductions. We didn’t have to argue or make a case of any kind. The rest of my time was spent making a spreadsheet of these hearings and the outcomes. The vast majority were exactly like the one I had seen. I was really shocked to find that this was happening all the time, and I had no idea. People don’t talk about elder care abuse in these terms as often as I feel should be appropriate. You find this in all sides of public interest law, however. There are truly awful things happening all the time, and we all only know the tip of the iceberg in our particular area. You are the current co-chair of Street Law at Villanova for 2016-2017. Can you tell us more about what you do through Street Law? Street Law is a student-run organization that visits schools and youth organizations to discuss the constitutional implications of current events and address questions or concerns young people might have. We primarily visit low income neighborhoods, and we allow the conversation to be largely guided by the students. Given that we try to respond to what they are most curious about, we tend to spend a lot of time on the first, second, and fourth amendments. Many of the kids have already had negative encounters with law enforcement, and a staggering percentage have been touched by gun violence. Students in every class we visited have shown genuine curiosity about their rights, and how that translates into their day-to-day interactions. We spend a lot of time in small groups, where the tone can be more conversational than a lecture. We use hypothetical fact patterns to stimulate conversation, and we coordinate with teachers to set topics that are relevant to the class curriculum. How did your education at Cal Poly help you prepare for your current work? Were there any courses, professors, or clubs that were particularly influential? I really can’t overstate how important Professor Williams and Professor Den Otter were to my time at Cal Poly and path to law school. Professor Williams’ guidance through my senior project really solidified my interest in poverty and homelessness. I loved working on that project, and I learned so much from her through the process. Like I said, the Politics of Poverty was probably the single most important class I took in undergrad. Professor Den Otter was enormously helpful in the law school admissions process. He was kind enough to be honest about the quality (or lack thereof) of my first personal statement draft, and helped me fix it to be what it needed to be. He set up an internship with a local judge during my third year, and that experience taught me so much about actually being in a courtroom. His Civil Liberties class was one of my favorites, and it was the closest thing to a law school class I experienced at Cal Poly. They are both truly amazing educators, and I am so grateful for their guidance. Mock Trial was a huge part of my time at Cal Poly. It helped me learn about trial advocacy and how to conduct myself in the courtroom. Currently, I am an intern with the Philadelphia Defender Association, where they have had me cross examine police officers. At this point in my life, I have done mock trial for eight years (four in high school, three in undergrad, one in law school). It certainly helps in a real cross examination when you have been practicing for so long. Being a part of the organization connected me to like-minded students, and many of us have been able to support each other through the law school admissions process. Front Porch was another huge source of support. I spent countless hours studying and praying there in the time leading up to law school. This summer, I will be working with the Philadelphia Defender Association as a certified legal intern. I began law school hoping to become a public defender, so this experience in one of America’s largest cities seemed like a great fit. Next year, I plan to be working with the Farmworkers Legal Aid Clinic and externing with Federal Public Defenders of New Jersey. I plan to become a public defender. After working with Judge Rita Federman in SLO, thanks to Professor Den Otter, I spent time with local attorneys I had met. Through my time with Judge Federman and time I spent shadowing public defenders, I was fairly confident that I wanted to stick to that career path. Here at Villanova, I am externing with the public defender’s office in Philly. I love the work and the work environment. Every day is interesting, and each client has a story to tell in court. I don’t know where I plan to end up after graduation geographically, but wherever I am, I hope to be a public defender. Cal Poly linebacker Chris Santini was named to the All-BigSky Conference first team last fall. Santini, who notched a team-leading 106 tackles, 12.5 for lost yardage, also earned the team’s most valuable defensive player award. Santini, a graduate of Leland High School in San Jose who transferred to Cal Poly from Boise State prior to the 2015 season, made 68 solo tackles, including 2.5 sacks, and also was the team leader with his five quarterback hurries. Santini also earned the team’s Mel Kaufman Award, given annually to the Cal Poly player who most exemplifies the virtues Kaufman became known for on and off the field. Cal Poly junior fullback Joe Protheroe has been named to the All-Big Sky Conference first team for the second year in a row. Other postseason honors for the 20th Mustang to surpass the 1,000-yard mark in a single season include first-team All-America honors from STATS FCS and his team’s most valuable offensive back. Protheroe finished first in the Big Sky in rushing with 1,334 yards and 13 touchdowns in 11 games. He averaged 5.3 yards per carry and121.3 yards a contest. A graduate of Clayton Valley Charter High School in Concord,Calif., Protheroe has surpassed the 100-yard mark in a game 13 times in his Mustang career. He also has nine career receptions. Protheroe's career high for a single game is 217 yards on 31 carries and two touchdowns in Cal Poly's 38-31 win at South Dakota State in September. He also rushed for 168 yards at Sacramento State in late October. Protheroe is No. 8 in career rushing yards at Cal Poly with 2,297 yards while his 1,334 yards this season is No. 5 all-time. His longest run is 76 yards for a touchdown at South Dakota State and Protheroe's longest reception is 55 yards, also for a touchdown, against Montana in September. The California Journalism & Media Affiliates recently named Paul Bittick, Cal Poly’s Mustang Media Group general manager, as the 2017 Journalism Educator of the Year in the 4-Year Division. The award recognizes leadership and support that goes beyond the journalism program and has impact across campus, community and local or regional associations. Only one educator from all California campus media associations earns this prestigious honor each year. As general manager, Bittick has been proactive in developing new revenue streams such as special sections, events and video services. He recently worked with faculty and students to create the first student-run "native advertising" agency within Mustang News. “This award for Paul is most noteworthy because: (1) there's only one given out each year in the whole state and (2) the recipient is selected by their peers,” said Mary Glick, Journalism Department Chair and previous Educator of the Year award recipient. Bittick came to the Journalism Department in 2002 with more than 25 years of experience in the newspaper industry. He served in a variety of roles for daily newspapers and worked as a freelance writer for the Associated Press for more than 20 years, covering college and professional sports. Barbara Kingsley-Wilson, the 2016 honoree, presented Bittick with the award at the California College Media Association Awards Banquet on March 4 in San Francisco. Previous educators of the year nominate current contenders for awards at the university, community college and high school level. The awards are funded by the California Press Foundation. On Feb. 26, five Philosophy students went to Dallas, Texas to compete in the intercollegiate Ethics Bowl, a philosophy competition for colleges and universities with the best analytical and argumentative teams in the country. Cal Poly's Philosophy Department sent one team to the national championship in Dallas for the first time in the program's short history. The team members are fourth-year Richard Shea, third-year Derek Diemer, third-year Ruby Allen, fourth-year Zackary Dackawich and third-year Ryan McGuire. The team earned their trip to Dallas after finishing in second place at the regional philosophy competition at Chico State on Dec. 3. "Philosophy competitions are applying what you understand about moral theory to real world issues," said Shea. At Ethics Bowl, teams are posed ethical cases by a moderator. The teams are then scored by a panel of judges based on their responses to the cases, arguments for a moral framework and practical recommendations as solutions to the problem. At the Ethics Bowl in Dallas, the Cal Poly team defeated Indiana University in the first round, tied Lynchburg College in the second round, but ultimately lost in the third round to Youngstown State University. "The team that beat us in the third round was in the finals both this year and last year, so we were up against the best of the best, and we held our own," said Diemer. The Ethics Bowl has existed on a national level since 1997, but Cal Poly has only competed for three years. "Some of these teams have four or five coaches, huge budgets and more time to prepare, and we still beat them in Chico," said Shea. "This says a lot about how awesome our instructors are." The two coaches for the Cal Poly team are Professor David Zoller and Professor Ryan Jenkins of the Philosophy Department. “Even though our department is small we have some really great professors that really do an amazing job training us in philosophy," said Shea. “It was fun and exhausting," said Diemer. "There were lots of early mornings and long hours discussing cases, but ultimately it was rewarding." The team returned to Cal Poly the day after the competition in Dallas and is already meeting to discuss preparation for next year's Ethics Bowl. Last fall, fourth-year psychology major Cameron Wiese co-organized Cal Poly's first TedX event, TedXCalPoly 2016, which featured talks from Cal Poly students and professors, as well as a host of other accomplished individuals from across the country. Speakers presented to a sold-out audience in the Performing Arts Center on campus. "Hands down, it was the best learning experience I've had so far," said Wiese, who co-organized the event with his partner, economics student, Eli Burch. The pair worked hard to find accomplished speakers whose stories adhere to the TED mantra: Ideas Worth Spreading. “A couple of us spent days digging through local newspapers, Cal Poly publications, and talking with as many people as we could asking them, 'who do you know that's working on a big idea'," Wiese said. Wiese and his team eventually came across worthy speakers. Many had ties to the College of Liberal Arts, including sociology senior Luke Fox, CEO of drone defense company WhiteFox, psychology professor Don Ryujin and philosophy professor Ryan Jenkins. All the the speakers for TEDxCalPoly 2016 presented topics or stories that fit the event's theme, "Plot Twist." Wiese said, "Most [students] are at a point in our lives when we're experiencing dramatic change, and it strongly resonated with the team, so we decided to roll with it." Wiese says that serving as a TEDx organizer helped him learn about himself as a person and a worker. In addition to finding speakers, Wiese solicited sponsorships, hosted a preview event for sponsors and coordinated the logistics. "From TEDx, I learned where some of my strengths and weaknesses lie, as well as the types of people I work well with," he said. "It's these experience-based lessons that will certainly shape my path moving forward." Wiese is currently honing his entrepreneurial skills on a new startup called PolyRents, a website that helps landlords organize tenant applications.